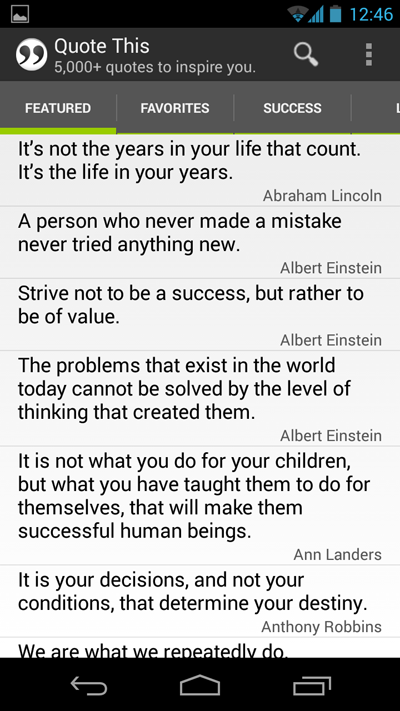 I’ve spent some time applying what I learned with the Mobile Employee Directory and created an app with a collection of more than 5000 quotations. Its a FREE App available in the Google Play Store. Take a look here for more screen shots, a more detailed description and of course to download it and give me some feedback. In addition to what I learned with the Employee Directory, I have used AppCompat v7, Fragments, Pager, Tabs, Loaders & Preferences. I intend to post more about what I have learned as well as write some additional apps with different functionality, so be sure to visit again or subscribe to the feed at the top right. « Building a Mobile Employee Directory – Step 7: Create an App Widget with it’s own ContentProvider & Service.